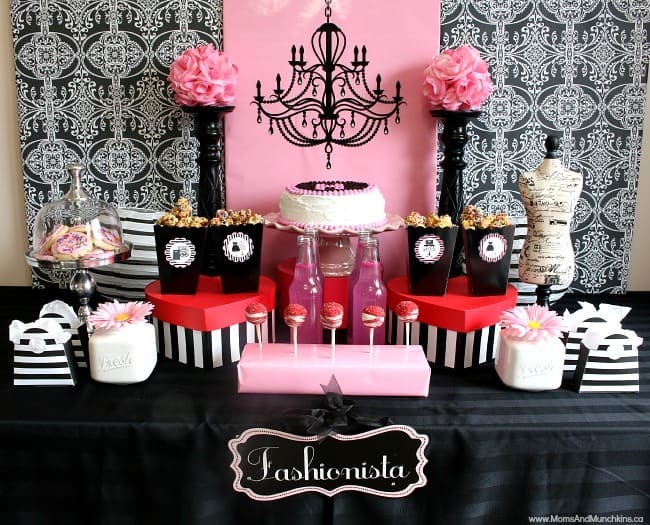 Thinking of party theme ideas for tweens can be difficult. I honestly don’t remember what I was into at that age. Actually, I think I just remembered…New Kids On The Block. Ha! Oh boy, I would have loved a NKOTB birthday party when I was in the 12-13 year old range. Kids seem to be growing up faster these days and many no longer want a party at home playing traditional party games. What do many tween and teen girls love? The mall. I know I loved the mall at that age – I still do! 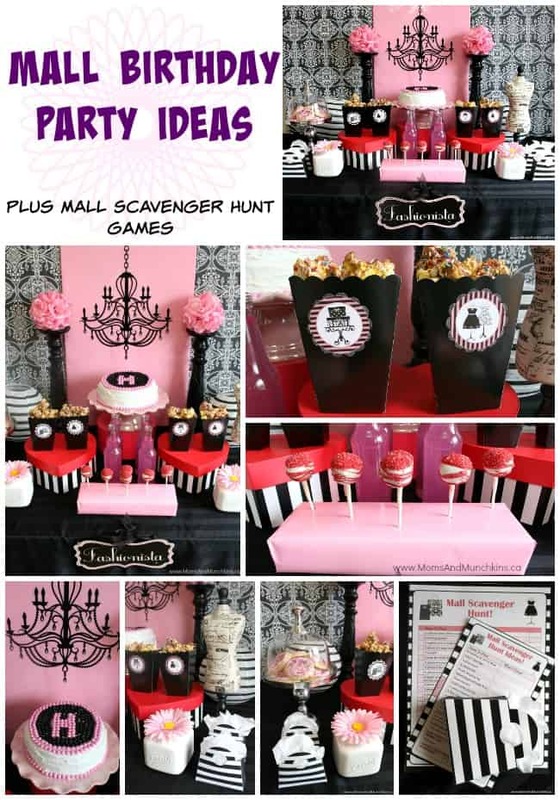 In our new Mall Scavenger Hunt Birthday Party set we have some fun ideas for setting up a party table at home or in a restaurant in the mall plus printable scavenger hunt games that they can play with their friends. A group dinner at a restaurant can add up quickly so this may not fit into your party budget. There are ways to make it work though! Instead of a full dinner, do just an evening of appetizers. Perhaps you could skip the meal completely and just host something in a bakery or ice cream shop. 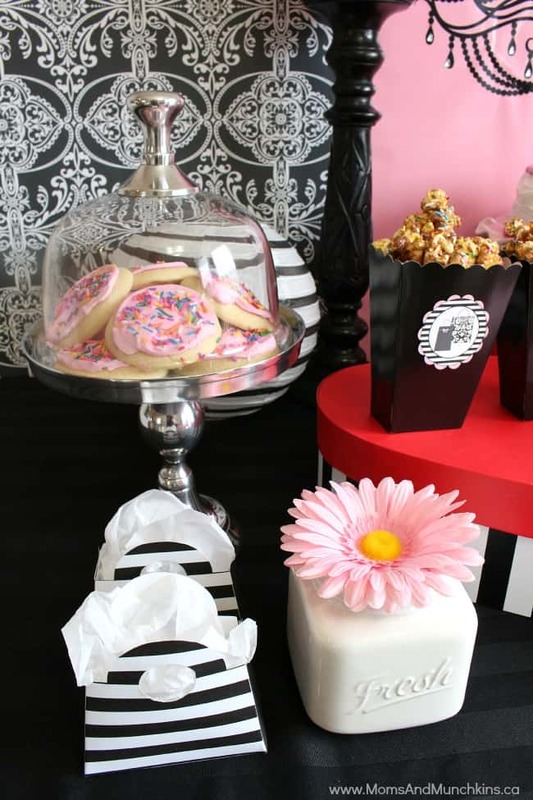 There are many ways to keep the party budget-friendly. Hosting the party at home is always fun because you have more freedom to decorate, it’s a private setting, you can make your own food and you don’t have to worry about limitations for items that can’t be transported easily (like a beautiful cake). circles that can be used for cupcake toppers, to decorate favor or snack bags, envelope seals, etc. 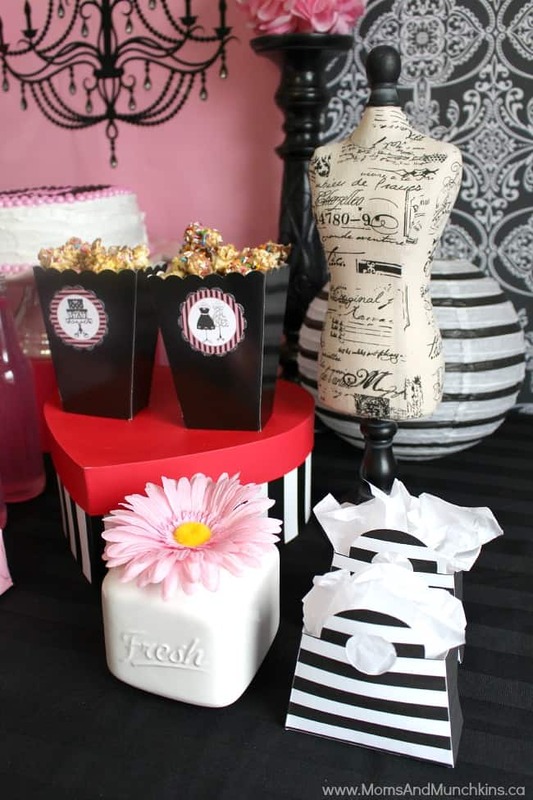 For this party setup, I used foam boards from the dollar store and covered them with wrapping paper for the backdrop. I used a chandelier wall decal to decorate the middle panel. 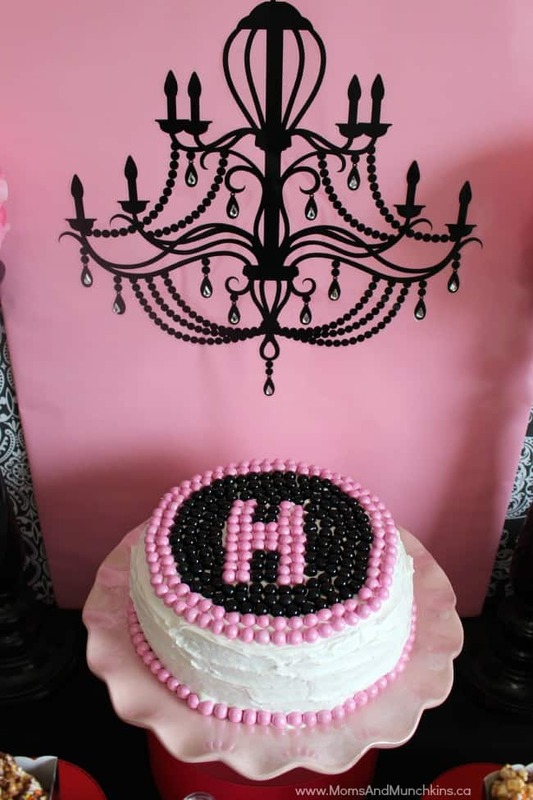 For the cake, I simply decorated it with pink & black Sixlets. A variety of cupcake flavors (set out like at a bakery) is another adorable option. For decorating the table I used a small mannequin, decorative boxes, tall candlesticks to hold flowers and some paper lanterns. For treats I served cake, cookies, chocolate covered popcorn and cake pops. 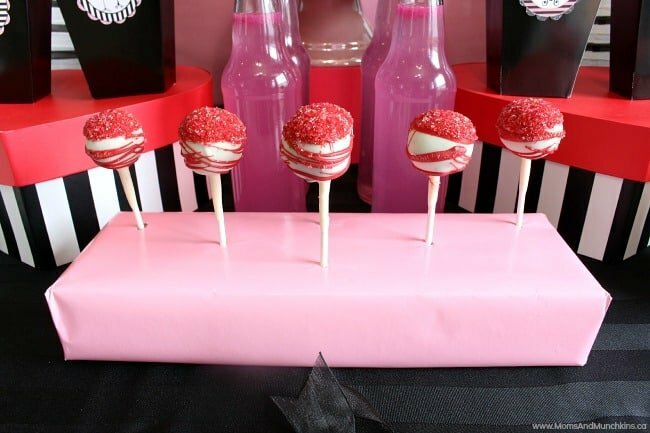 For a super easy cake pop stand, simply cover a block of Styrofoam in wrapping paper that matches your theme. 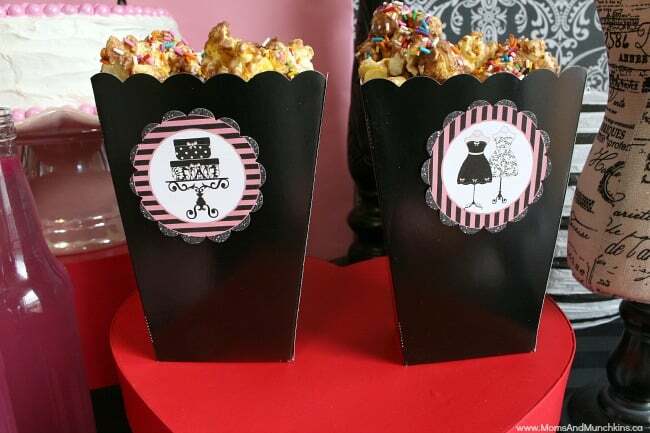 The printable favor purses could be filled with mall gift cards, mall coupons, nail polishes, lip gloss, etc. 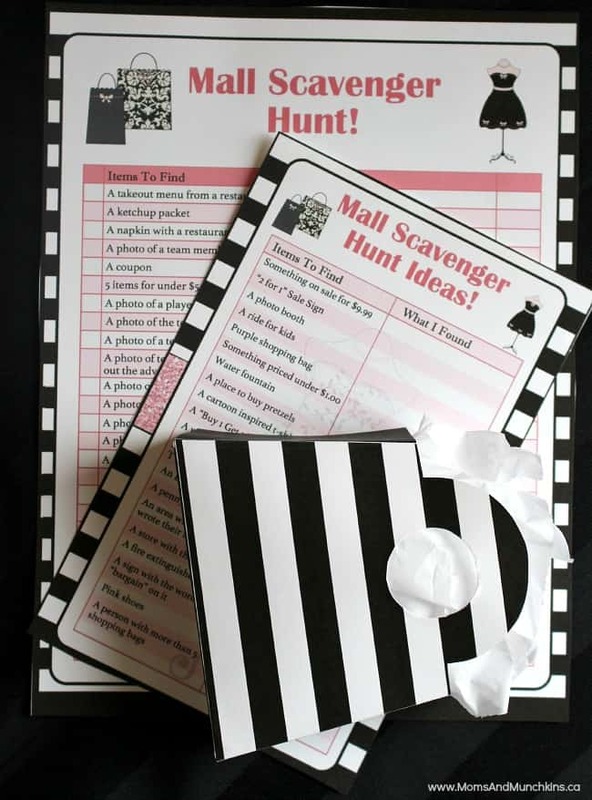 For the scavenger hunt games, the kids can wander the mall in teams and search for the listed items. They don’t have to bring all of those items to you but instead take pictures with their cell phones to show that they found each item on the list. They are fun games sure to lead to some giggling! This fun printable set is now available in our Etsy shop. 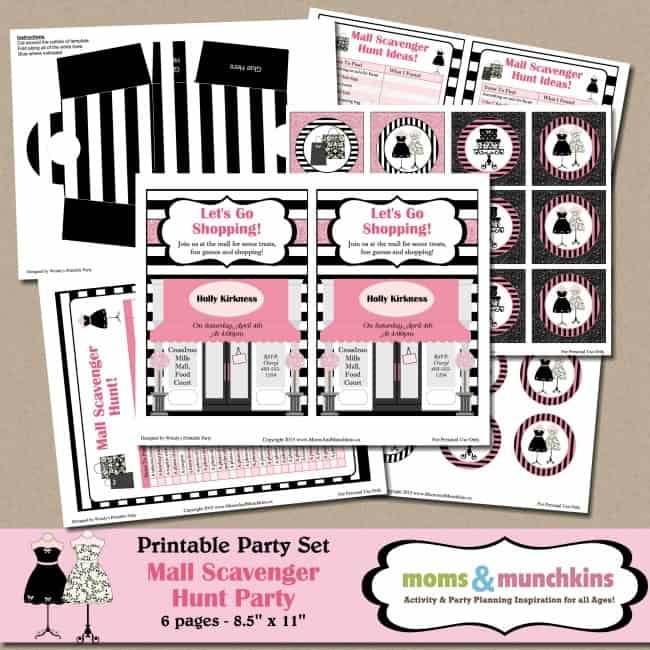 Thank you to the fabulous Wendy of Wendy’s Printable Party for helping us with the printables! Have you ever hosted a birthday party in the mall? 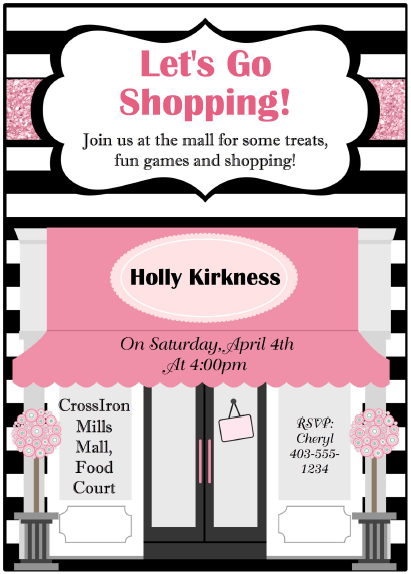 Check out this cute receipt-style invitation our contributor Kristie made for her daughter. 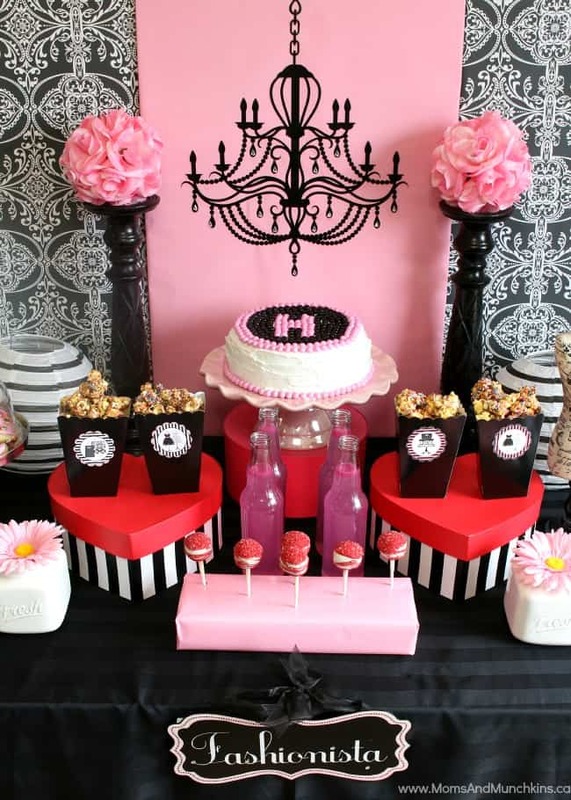 We’re always adding new ideas for parties and family fun! Never miss an update by following us on Facebook, Twitter, Pinterest, Google + and Bloglovin’. Love this idea! And love the pink & black! I purchased the complete set invite was not included. it was listed in items can u please send.